Hey there! Today I wanted to give kind of an update to how my life has been with my bullet journal. In October I started using a bullet journal, and I went into detail about that in my “Why I Use a Bullet Journal” post that I did back in February. It’s been about, actually over, six full months of using a bullet journal and I wanted to share how it’s been! So in October, I started using a bullet journal. I got a dotted Moleskine journal, went over to Pinterest and began my bullet journal journey. I had no idea what I was getting into, but I knew I was getting tired of traditional planners that I felt like I would get bored of and stop using. So, with that, it has been just over six months since I started using my bullet journal and I have been obsessed with it! I use it as a planner as well as a journal. I plan my day and everything and then in the space that is left over, I write about how my day went and anything exciting that happened, if anything. I did this in hopes of it helping my memory. I feel like I forget things often and I felt that if I got in the habit of writing more often and writing down how my days went, then it would help my memory. I also wanted to do this to be able to look back at the time that had passed and see what I had done, and how I felt over that period of time. The awesome thing about using a bullet journal is that you can make it however you want to! Now, this is definitely something that is debated often in the community. However, I am in the mindset of, if you are using the basics of the bullet journal but customizing it to fit you, decorating it to fit you, then you are using a bullet journal. That is the beauty of the bullet journal. It is designed to fit you and your needs and is specifically tailored to what you want in a planner. That is the whole point! What’s even better is that one of my coworkers also uses a bullet journal! She started after me, but there was one night at work where we had to stay for a late flight and we both were just looking at each others bullet journals and talking about what we wanted to do with it! It was so nice to see someone I know and work with to be as interested as me! I definitely believe that if traditional planners are not working out for you or you feel like they don’t represent you, then you should definitely try a bullet journal. After six months, I have not given up on my bullet journal. There was a week or so where I didn’t do the daily journal aspect and it was a pretty busy week at work and I was just too exhausted. Even after that, I felt really bad that I didn’t keep up with that. It actually bummed me out, I’ve been that obsessed with it and it has helped me that much. Besides that, I have kept up with my bullet journal and have not felt like I was forced to do so. It never felt, or feels, like a chore to open up my bullet journal and write in it and it shouldn’t! Your bullet journal should be a place that you enjoy going to and writing in. That is what I have gotten out of it. If you find the system that works for you, you will never dread opening up your bullet journal! Below, I have linked some of my essentials that I use to keep up my bullet journal! I will also be doing a dedicated post to my bullet journal supplies in the near future! 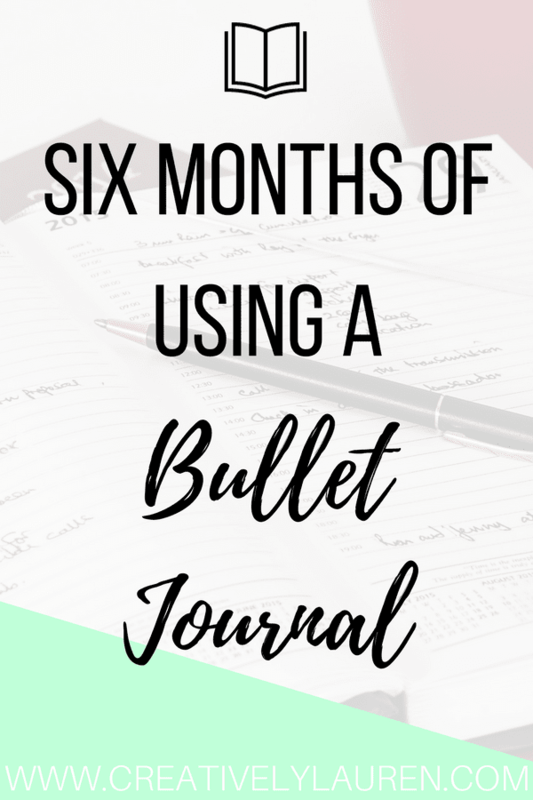 Have you used a bullet journal before? Let me know in the comments! I love writing bullet journals too. Anything that will help me stay more organized and constructive with my writing I am all for. And since starting bullet-journaling, I feel that my writing is a lot more clear. However, for more important pieces of writing, documents and such, I still use services like https://www.essaynara.com. They are very attentive to detail and, like bullet journals help me stay on top of things. I basically bullet journal but in my planner. My planner is a work horse and I skip the pretty stickers, drawings, and fluff.